The Megalith edition is Selection #9 of The Games Collection by Pin International. This two player game has druids competing at Stonehenge to be the Master Druid. Each player has 8 coloured megaliths (just tall blocks) and 9 matching discs, numbered 1,1,2,2,3,3,4,5 & 6. The board is a triangle of 5 dissecting lines, with the corners lopped off,so the lines are 2,3,4,5,4 spaces long. On each side are 5 extra spaces, where players put their megaliths. First to get their 8th megalith down, wins. Players take turns to put a numbered disc on the intersections of the lines. When you have the majority total in any direction, you claim that line by placing your megalith on the end point. Ties on a line are lost by the last placing player, a clever balancing rule which forces careful choices. 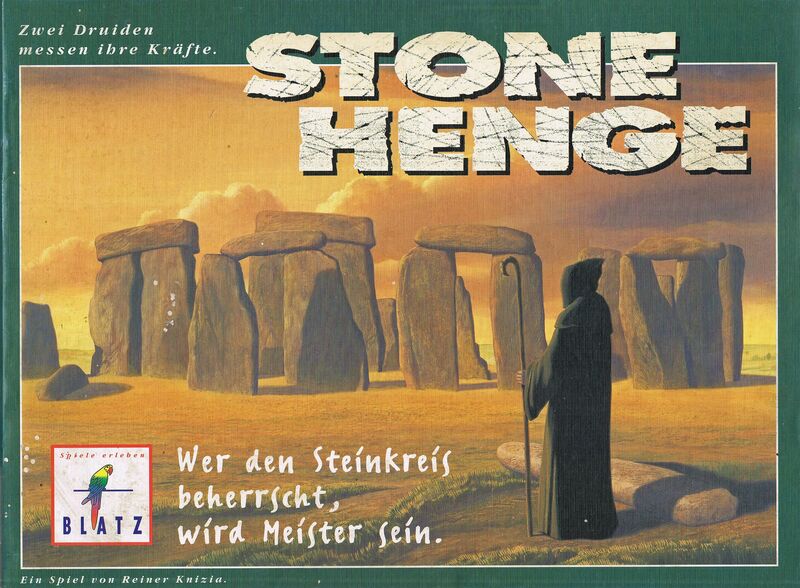 Stonehenge is a same game as Linea (Spielbox 1992, smaller board).